Please Note: These dogs are courtesy listings and are not part of BCIN's program. If you are interested in Bodi, please contact mokanbcrescue.org. BCIN provides this serviceto help owners who must re-home their dog. Please be advised that BCIN has not evaluated nor tested the temperament of any of the dogs that are courtesy listed on our website. 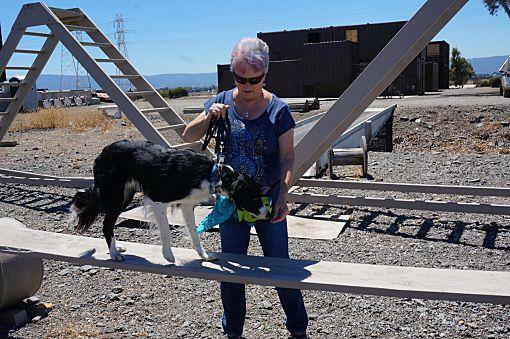 Bodi was adopted from Mokan Border Collie Rescue in Kansas to do forensic search work in Saratoga, CA. He did a great job when working inside buildings, but once outside in large training areas he would get easily distracted by noises, rabbits, lizards and take off to chase them. So his career in search work is not going to work out. Bodi is a beautiful, exuberant and energetic dog. He loves his person, and tries hard to please. He loves to play with other dogs but definitely needs a controlled introduction. He is smart and can learn things very quickly. He taught himself to “shake” by watching my other dog get a treat when she did it. He is beginning to learn how to put his toys away at night. This boy is a huge “tattle-tale”. When my Piper steals his toy and won’t give it back, he will come and poke me until I go see what he wants, which is to make her give him his toy back. I have video to prove it. 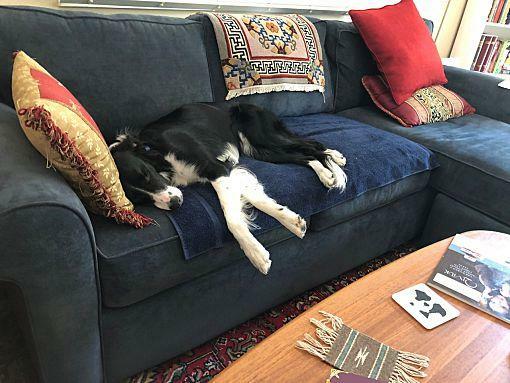 Bodi really needs a large, fully-fenced area where he can exercise his long legs and run to his heart’s content. He is hyper-aware of all sorts of critters from spiders to squirrels, especially lizards. He has over-the-top prey drive, but not a lot of focus. He is crate-trained and rides quietly in the car. He just wants to go with you. Ideally, someone who is a runner would make him very happy. He needs to burn energy. Bodi will NOT do well as an outside dog. This big boy loves to cuddle up in my lap in the evenings and will come over for hugs during the day. Bodi sleeps quietly on his own bed in my bedroom and won’t bother me until I begin to move around in the morning. While not a big barker, he will tell you about people walking past “his” house, or ringing the doorbell. He routinely settles quietly during the day. Give him a chewy bone or antler and he is a happy boy. He would not be good with small children because of his exuberance and high energy. He would would be great with older, active children. No cats, please. Remember the high prey drive? 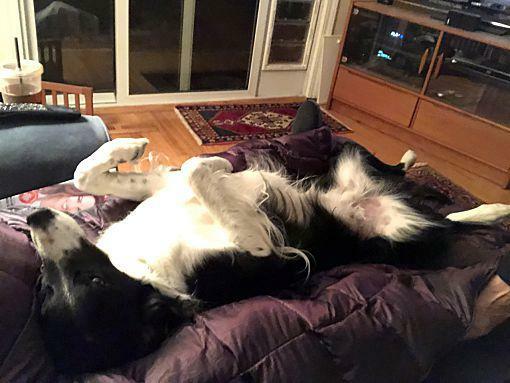 If he is like most border collies, Bodi will begin to settle down and mature at about age 3. He just turned 2 on Nov. 1. He needs structure and to be held responsible for obeying commands. Tell him once, make him do it. He is very soft and a firm “no” will usually stop inappropriate behavior. 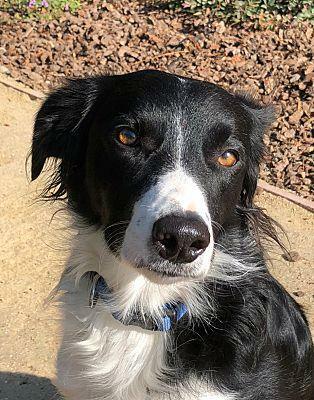 Bodi would like his forever home to be active and loving where he can just be an active and loving dog. But he does need structure. Bodi needs a strong leader, if you aren’t the boss, he will take over. If interested in adopting Bodi please fill out an adoption application at http://www.mokanbcrescue.org/ .